"A $2 billion cruise ship terminal idea was floated again at Kirra. So many things that are totally wrong about this whole idea. 1. Ruining our beaches by stopping natural sand flow to the northern Gold Coast that is already eroding. 2. Pollution from the ships will be ridiculous and effect wildlife especially around whale migration season. 3. Ruining the world class waves we have that also generate millions of dollars in revenue for local businesses. Make your voice heard against this ridiculous idea." Attempting to discredit Mick Fanning shows desperation and a lack of judgement by the author(s). So who was that author we ask? For GCB to post or approve comments written by a non surfer (claiming to be a surfer on the Gold Coast for 33 years) is misleading, deceptive and an indication of where this has been heading for some time. Mick Fanning has characteristics that anyone in any field can admire - the ability to stay calm under pressure in the recent Pipe Masters contest to secure his 3rd Surfing World Title proved that. Sure he has great natural ability but his application and mental strength are admirable and proved to be the deciding factor. In one heat Mick had 8 intense wipeouts and still maintained his composure to win. The image above of Micks last wave to secure his world title shows incredible timing to hold off and only turn at the last opportunity to get as deep as he can to score enough to win the heat. View a description through his eyes. "You can be the best surfer, diver, artist, I'm happy for you, but I will be listening to the people that matter ... 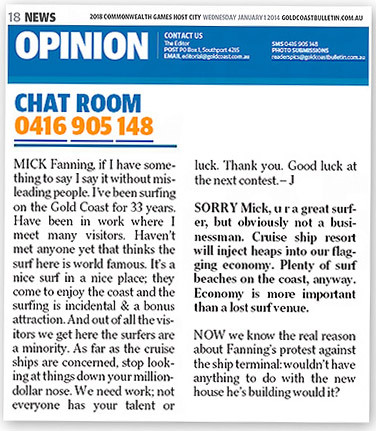 It's more of an issue for high-profile people like the CEO of a cruise ship company ... they're the high-profile people I'm worried about ... Every Mick Fanning that comes out, I can find a high-profile surfer to say it's a fantastic idea." SOSA has been working with Save Our Southern Beaches Alliance since it's inception - in fact we were at the first meeting. Recently Dr Steve Gration working with a member of the Save Our Southern Beaches Alliance put a valuable piece of research onto the desk of all local councilors and some politicians. Councilors were simply left in the dark on the whole CST picture for SE Queensland and were unaware of the plans for Brisbane's new mega CST. To plan for three International Cruise Ship Terminals within a radius of 80 kilometres reflects political and economic lunacy." 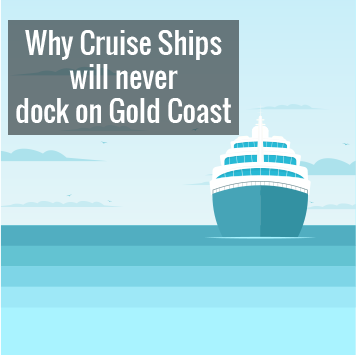 We were surprised to learn prominent councilors simply unaware that the Brisbane Cruise Ship options made a Gold Coast CST totally unnecessary. It brings us back to the same old worn out developers attempting a public land grab scam with claims of public benefit that do not stand up to proper scrutiny.